When the figures for Harry Potter: The Deathly Hallows were announced as being in 5" scale, I knew I'd found my Angel. 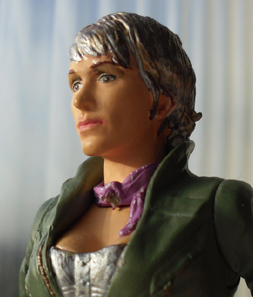 Having said that, I did try to make do with figures I already had and repainted a Helen Cutter with silver hair. With the best will in the world, she still looked like a middle aged woman and I needed Angel to be very young so as soon as they were released, I snapped up a Hermione figure and set about changing her hair and eye colour. To bridge the gap between the classic and modern series, I decided to use the RTD TARDIS for the 8th Doctor. It's far more imposing than the small but lovely classic version. I originally considered using the RTD Daleks but then thought they would be better saved for any kind of Time War story I may do further down the line. Saving that design would give them more of an edge later on. I considered using the Moffat Daleks, given that these are supposed to be the 'definitive' versions. I decided in the end to continue with the classic design as an extension of the 7th Doctor era. The jobs are the same as the new Daleks though. The Black Dalek is the Supreme while the white/gold ones act as the Drones. 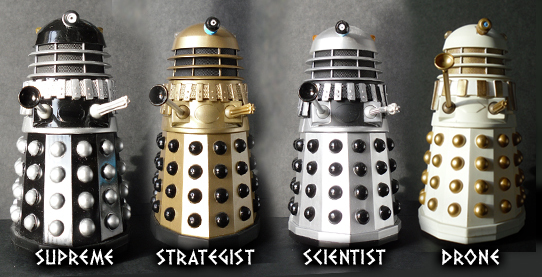 The Scientist role is covered by the Silver Daleks while the Gold Dalek is the Strategist. There isn't an Eternal. Part One was posted on the 25th February 2010 (actually a day earlier than planned) with part two following a week later on Saturday 5th March. The series was originally to have begun a month earlier but although stories one and three were completed, it was deemed better to have at least half the series completed before starting transmission. There was plenty of build up in the weeks leading up to part one. Two weeks before, a trailer for the series was posted in place of the 8th Doctor page. A week ahead of transmission, a 'bumper preview' of the whole series was posted. To capture the spirit of the era, some 90s magazine covers were made along with a mock billboard poster. Angel Bright is in her solar yacht when it is suddenly pulled by accident into the timestream, attached to the TARDIS. The Doctor and Angel dislodge the two ships but Angel's yacht crashes. Now the Doctor realises they are on Skaro. Angel saves the Doctor from one Dalek but when more arrive, they are captured and taken to be scanned. In the city, the Doctor's new sonic screwdriver proves effective against a Dalek and they escape. They discover that the Daleks are being upgraded to a new battle form. And using a time cannon, the Supreme intends to instantly upgrade all Daleks anywhere in space. The Doctor stops them by stealing a component from the upgrade machine and heads off with Angel in the TARDIS. The Supreme is nonplussed. 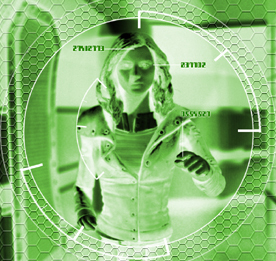 Exposure to time travel will energise the core. He plans to take it back once it is ready. In the TARDIS Angel realises the possible journeys ahead and elects to stay aboard. The 8th Doctor was the last CO Doctor figure to be released. As of this date, he is only available in the Eleven Doctors boxset. As such I felt I couldn't just do a one of story for him. This had to be an event. 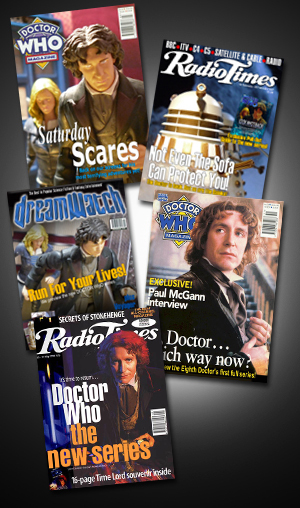 Since his first appearance in 1996, the eighth Doctor has been used a lot, appearing in monthly novels from 96 right up to the modern series in 2005, in the DWM comic strips and on Big Finish audios that continue today. On the AFT the eighth Doctor had enjoyed a run of stories with new companions. So with a new figure, I had the choice of continuing where he left off or starting afresh. I chose the latter and cast my mind right back to 1996. The TV Movie has just aired. We have a new Doctor. A universe of new possibilities, unfettered by cluttered backstories. A chance to put a new stamp on the show. Angel Bright. She’s proper aristocracy descended from the winner of Big Brother. She’s spoiled, but not in a nasty and irretrievable way. She’s just ignorant of the way other people live, though she thinks she knows how the lower classes behave. The youngest daughter of the House of Beckham on the planet Windsor.She’s had a privileged background and wants to get away from it. She’s bored and wants adventure. She retunes her radio so instead of hearing celebrity gossip she hears about the Dalek war. She wants to get involved but her solar yacht will only take her to the edge of the Windsor system. Maybe a trip to skaro wasn’t quite what she had in mind but it beats another day on her yacht beating off emails from layabout wannabe suitors. She’ll relish the excitement. She doesn’t have a gun and improvises something against the Daleks. She’ll think the Doctor is a kidnapper or one of the Papparazi until they both end up in danger. The original storyline was very much about the Doctor and Angel meeting and getting together but the Daleks' plan and motivation was very run of the mill and didn't sit well in the dark, scary atmosphere I wanted the series to have. I was very much in favour of using the Daleks for the series opener but to justify that, they had to do something different so I came up with the gruesome plan to experiment with human fear. The confrontation in part two was originally to see the Doctor simply blast the Dalek scientist with the fear machine but then I came up with the idea of talking him into a panic. 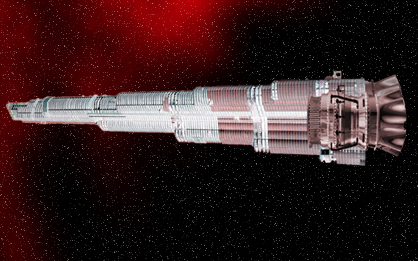 The starliner set is the Moonbase set from The Seeds of Death, turned red with a floor of gold card. The TARDIS interiors were the last scenes to be shot and were done on 7th January, at the end of the shooting for the whole series as the required set was very large. 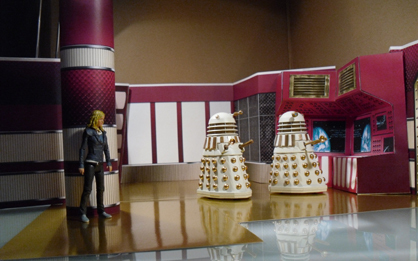 The Dalek control room scenes use scenery inspired by City of the Daleks, the online game. The Dalek ship is pieced together in photoshop using the sides of the Dalek Emperor from Parting of the Ways and a Star Wars separatist droid. The Jedwood is based on the Burge Tower, the tallest building in Dubai. For the Doctor himself, this story comes right after the TV Movie. A pre credits sequence was to have been written starting with the line "Oh no, not again!" but it didn't fit with the story. If you remember the original AFT 8th Doctor stories, don't worry, they will be back. They are set after this period. In terms of the universal timeline, it's some time after the Dalek/ Cyber war which was alluded to in last month's Time Locked. Don't take the Dalek's survival as proof that they won the war. No date is mentioned in the story but I place it at 3011, a thousand years from now.